On December 12, 1894, the trustees’ executive committee proposed installing a campus telephone system for the first time: “it was resolved that the superintendent be directed to connect the college [Main Building], and the Engine and Boiler House with Mr. Law’s apartments in the Gate House, by telephone.” By 1902,Vassar had significantly expanded its campus telephone system, installing additional telephones for student use and a line connecting the new Swift Infirmary to the Physician’s quarters in the southeast corner of Main Building. However, general outside communication wasn't possible until 1916, when a service line connected Vassar to the New York Telephone Company. Soon there were requests from faculty members and administrators to have telephones installed in offices and houses around campus. After 1916 the campus messenger system was adapted to bring messages between rooms with and without telephones. The telephone system stayed about the same until 1926 when a more "modern and comprehensive" telephone service was installed providing all academic and business offices, dormitories, and faculty housing on campus with telephone lines. All calls made to the college and from within the college were routed by operators through the Vassar College Switchboard. 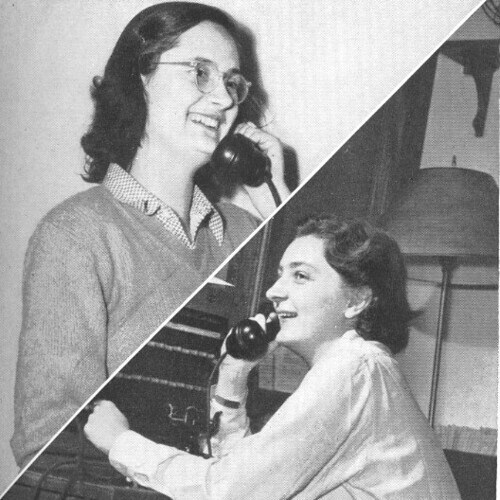 The next change to the telephone service came thirty years later, in 1956, when Vassar updated its system to a dial service. Telephone users no longer had to tell their desired extension to an operator; they could dial it themselves for a direct connection. However, all incoming and outgoing calls to and from campus still had to pass through the switchboard operators. In 1973, the campus updated again, creating some direct outside lines to try and relieve pressure on what Vice President for Admiinistration Jame Ritterskamp called "a very antiquated system" that routed all calls through the manual switchboard. The switchboard was replaced in early 1982 by a completely computerized system. Operators remained in the Message Center in Main Building, mainly to route calls from off campus and to assist with on-campus emergencies. In 2005, a complely automated voice-recognition system called Parlance was installed to direct off campus calls and provide telephone information. Campus operators remain available weekdays during business hours, and emergency calls at other times are routed through the Security Department. Executive Committee Minutes Jan. 1894-Dec. 1909. Vassar College Special Collections (VCSC). Mary W. Clarke, “The Future: Foretold to Miss Clarke,” The Vassar Miscellany, vol. VII, no. 1, October 15, 1877. “College Notes,” The Vassar Miscellany, vol. IX, no. 5, February 1, 1880. “Home Matters,” The Vassar Miscellany, vol. IX, no. 8, May 1, 1880. Linda Malone '75, "Ma Bell Goes," ﻿The Miscellany News, vol. LVIII, no. 5, October 26, 1973.